You respond to a call on Venice Boardwalk: a small dog has been attacked by his roommate dog. The poor woman moved in to a vacant room and has been also forced to share the apartment with a young male Akita. 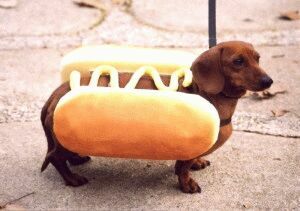 She had even mistakenly thought her doxie could be the new little Mascot for The Sausage Baron on the Beach. But no no no. The Baron’s dog would not have it and you are assigned repair duty. The shaken ex-new roommate tells you this is not the first time that Jordan (not his real name) the chewed up Dachshund has been tasted by the Akita who lives above the Sausage Empire with jewels intact simply protecting his territory from any would-be new cute little “Mascot” with any designs on being favorite to the Baron. A beautiful early morning drive to the Far Continent as you call it owing to the fact that every destination in Palos Verdes is 8 miles from the freeway a painful tragedy of civil engineering flaws in the system and you end up on the bluff overlooking grand ocean cliffs and Donald Trump’s golf course with ridiculous vacant estates down below. 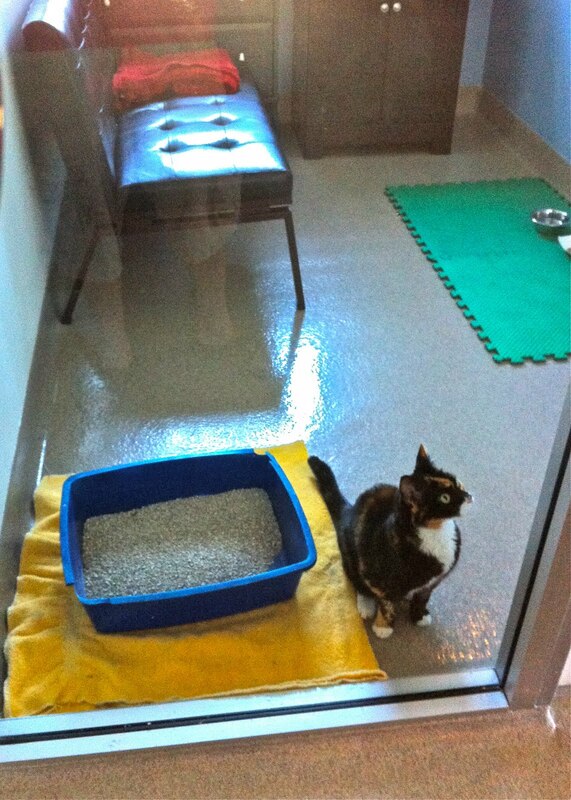 It is here you find the lovely caretaker of animals indoor and out and she asks you in and she leads you past picture window sweeping views and into a room to a cowering little Torti under the bed. Rocky (real name because of her nickname) plays a game of chase me here and there down the stairs up again and into the bathroom. She is snuffling snorting through her nose. You find Rocky has been bitten in the face mostly likely by a raccoon judging by the story of our caretaker, the puncture wounds into her sinus. You picture a curio us cat nosing up to a cowering raccoon outside since the raccoon enjoy cat food as much as the next wild animal and the pickens are getting slim much like the look of the coyotes. Rocky heads 8 miles out from the Far Continent back to Metropolis and the clinic to be radiographed, surgically repaired, and hospitalized. She is a lovely little cat as it turns out and a staff favourite. You grow quite fond of her during her stay in her own private suite and your office. She is even more of a joy on her SECOND round of hospitalization…but that’s a later episode as ATTACK WEEK continues…Standby Rocky. You erroneously assumed that a couple fun hours with the family at the bowling alley could go by without the service summoning you again. You ask the caller to hold while you gutter two balls not distracted at all by this, the third attack, this time dog on dog. It’s a typical struggle of young vs. old, strong vs. weak, Akita vs. Sharpei Cross, owners-on-vacation variety of attack. The caller is your neighbor who was roped in as dog sitter while the previous dog sitter has a medical emergency of his own. 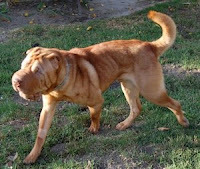 Now you come to understand the Sharpei is under the house and was attacked LAST NIGHT. You envision wounds starting to fester and the dog going septic aka bacterial blood infection when you hear the dog is not eating. You inform your family of a shortening of the evening of bowling ending on just one single game once again they all painfully acquiesce and head back to your SUV. You arrive at the dark residence to find a frightened bloodied Sharpei/Shepherd mix Agatha (not her real name) being consoled by your neighbor Patty the defacto dog sitter. You calmly examine Agatha and sedate her and soon she is calm and carefully whisked off by you and Alex the Tech to the clinic for some surgical repair and hospitalization. You are rudely reminded while suturing and debriding a Sharpei that the cut edges of this breed’s skin is like a sort of “goo”, or sticky gel. Most unusual. In fact, certain of the small lacerations and punctures have automatically glued back together by the goo. You piece the dog together and place drains and keep Agatha at the clinic in her own suite. Yes lodging in the same suite as Rocky Raccoon the previous attack victim. The previously aggressive dog has becoming quite loving here in her safe environment where she stays to heal her housing situation up in the air. Can she return to the hostile home with the young Akita or should she find a new place to live? Was the balance simply upset by the extended leave of the owners on vacation as you have found to be a verified phenomenon. The owners may have created a power struggle and their absence triggered a power grab by the Akita since they certainly must have punished his outbursts against his elder aunt Agatha the shear disrespect has raised the owners ire leading to reprimand after reprimand of the juvenile mush dog creating further imbalance. The stage was set by PREVENTING a natural pecking order to occur. If the Akita is meant to be dominant then it should be so. You discharge the damaged, yet recovering Agatha who jumps for joy to see the returned vacationing owners of the dogs. They admit scolding the Akita for attempting to dominate the previous Alpha Agatha. But the change would have happened and peace restored quickly and naturally if it weren’t for owners’ (although well-meaning) interference of the process and the damage may have been avoided or at least postponed for awhile. Can’t we all just get along? After the third ATTACK you fully accept the arrival of the FOURTH in the series when a frantic previous client calls and is in need of assistance getting the cat into a carrier and to the vet. Instead you offer a home visit to assess and treat on site or transport with sedation as needed. Upon arrival to suburban Beverly Hills, you exit the vehicle in the driveway to meet the worried owner and both look down on the ground between the adjacent neighbor driveways to find multiple tufts of fluffy white hair and both surmise that we are standing on the battlefield where BOOTS (not his real name) stood his ground and made a stand on the border. The woman proclaims that the marauder cat should know better and not have entered her cat’s territory. It’s a rule of catdom, she espouses. You beg to differ. Cats who spend anytime outdoors are at risk of getting into a fight, hit by car, catch a virus, some deadly and so on. You extract the poor, shredded kitty from (where else?) under the bed with kindness and sedation. The owner continues to maintain that the marauder should respect poor Boots’ land. 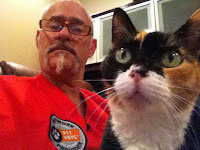 Due the severity of the injuries and multiple locations you decide it be best to bring the cat in for repairs under gas anesthesia at the clinic. Boots hangs out with you for the day and is released in the afternoon without an E-collar that you had advised. You’ve come to accept people’s personal dissent with certain veterinary standards like neutering before puberty or rejection of antibiotics or corticosteroids as well as the rejection of post-op recommendations. But fortunately Boots leaves your sutures alone. And returns to his chaperoned visits within the high-walled-in backyard with his mom and only looks longingly now and then through living room picture window overlooking the front lawn formally known as his territory. Sunday comes around and a full day of family fun and treatment of the attack victim in-patient, Rocky Raccoon who has survived a Raccoon chomp to the face and has now revisited your clinic due to an adverse reaction to a certain anti-inflammatory and must repair his kidneys with IV fluids etc but now the day has ended or has it you think as you lay your head down tentatively upon a cold pillow just as the Service buzzes the iPhone. You snap to coherence for the consult with the frantic owner. His little dog, Ty (not his real name) was attacked by a Coyote and they need you to come finish off the poor dog. The owner describes the lack of breathing or shallow breathing and the condition improves with his every word and now the dog is sitting up and how weird it was that he looked half dead and you explain he was actually in shock and has snapped out of it and the owner sees blood and implores you to come. You arrive bleary-eyed at the Los Feliz estate the housekeeper motions you inside the property gate that swings closed behind. You are greeted by an energetic Aussie and bulldog that lead you up the steps into the house as if they know you are there to help their wounded friend. The mom and dad of the house greet you and lead you to the fallen Ty cowering in a dog bed in the hallway. You give the pup a painkiller after determining his stability and surmise that several deep puncture wounds in the neck are in need of surgical attention. You wrap Ty’s neck with bandage materials and padding as the dad explains that the coyote had grabbed the dog by the neck with his collar in his mouth as the horrified housekeeper was screaming all the while and thereupon reaching the gate the coyote must have received a nice jolting shock and dropped Ty. You come to understand the victim dog, as well as the other pets, are equipped with a shock collar associated with Invisible Fence surrounding the property. Thus, Ty is saved by the electronic collar which the coyote broke off and dropped in the yard.